I really think that my most recent incarnation of the compost bin would have kept out critters if our dog and the local tree rats hadn't teamed up on me. 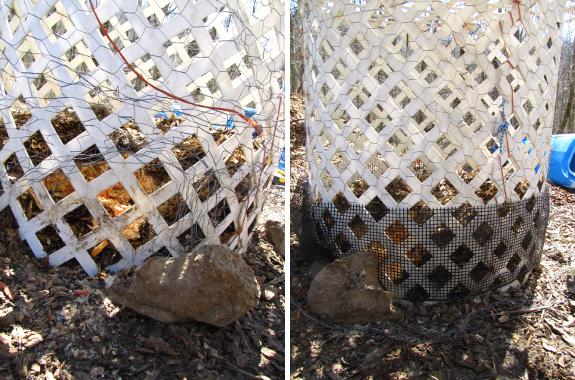 Lucy rolled the rock off the bottom of the chicken wire and pushed the mesh up out of the way, then a squirrel jumped in through the medium-sized holes left behind and shoveled food down to where Lucy could stick her nose in and lick it up. Version 3.0 is reinforced with some heavy-duty plastic gutter guard, wired in place on both the top and bottom. As long as the desparate duo don't enlist a bear, I'm hopeful that our compost will stay in the bin. Maybe.